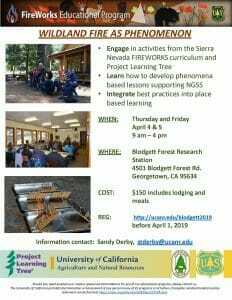 Placerville, CA, March 12, 2019: The University of California Cooperative Extension, US Forest Service and the Center for Forestry at UC Berkeley will be hosting a two-day workshop on integration of wildland fire science into education of youth from Kindergarten through 12th grade. It is aimed at both formal and non-formal educators interested in incorporating wildland fire science into their educational engagement with youth. The workshop will be held Thursday and Friday April 4th and 5th from 9 am to 4 pm at Blodgett Forest Research Station, 4501 Blodgett Forest Rd. in Georgetown in El Dorado County. 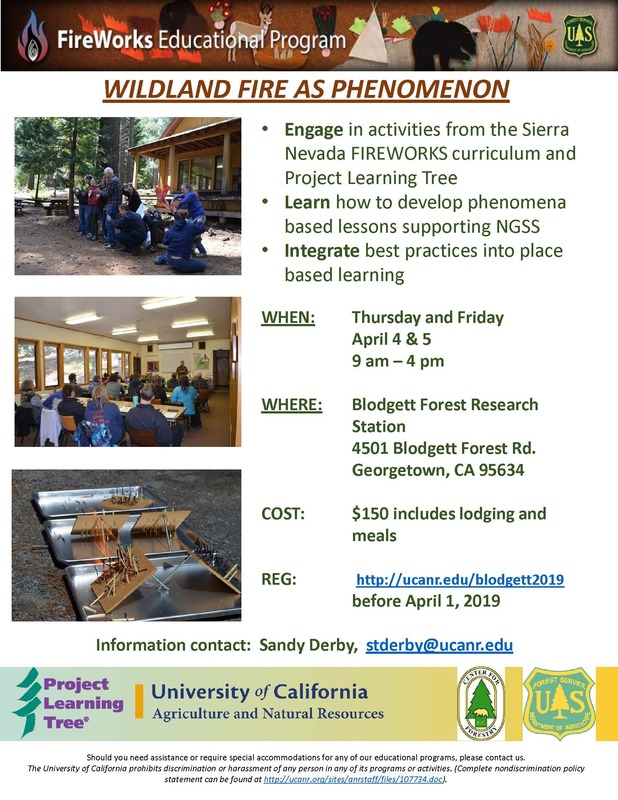 Objectives: The workshop will familiarize participants with FireWorks, an educational program about the science of wildland fire, designed for students in grades K-12 consisting of a free downloadable curriculum and directions for constructing a trunk of materials. The program was developed by the US Forest Service Fire Science Lab in Missoula, Montana. The Sierra Nevada FireWorks content focuses on the physical science of fire behavior, human influences on fire, and fire ecology in the Sierra Nevada. It is currently available free of charge at https://www.frames.gov/fireworks/curriculum/sierra-nevada. The cost of the workshop is $150 which includes lodging at Blodgett Forest and meals for the full two days. Please register at the following link before April 1st: http://ucanr.edu/blodgett2019. For more information please contact Sandy Derby at stderby@ucanr.edu.